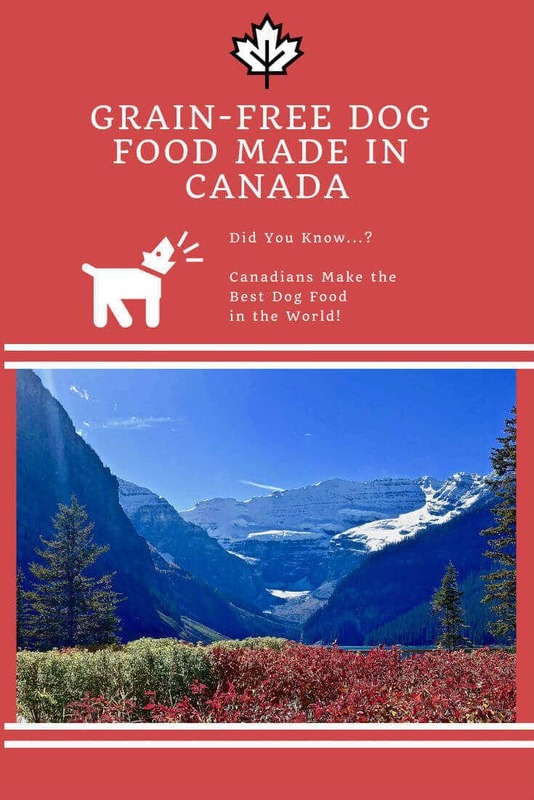 Look no further for the best grain free dog food made in Canada! Including a detailed look into 4 top-notch Canadian dog food brands (& a big ol’ list of Canadian grain-free dog foods). In addition to maple syrup, poutine, and goose-down jackets, there’s also something else we Canadians excel at, and that is making high-quality grain-free dog food. With rising fears about ingredients being shipped in from Asia, you may be in the market for a high-quality dog food crafted a bit closer to home. Just check out these excellent Canadian-made brands that are taking the world by storm. Orijen has that meat-based protein your dog craves and will thank you for. Orijen is incredibly good for your pet with the awards to prove it. Seriously, be careful not to get lost when you pull up the awards page on their website. Orijen’s incredibly high protein content is ideal for highly active dogs and the fact that it’s made in Canada makes it that much better. ACANA is known for its meat-based formulas that contain locally sourced ingredients. ACANA has always prided itself on being one of the best foods on the market and it’s easy to see why. There’s no mystery when it comes to deciphering their ingredients: they simply pack in the good stuff. You might notice that ACANA looks remarkably similar to Orijen, and that’s because they are. They are both made by Champion Pet Foods, and both are wonderful products. Horizon is all about sourcing, manufacturing, packing, and shipping their product from their own plants in good ol’ Saskatchewan. Horizon foods contain locally sourced ingredients direct from Canadians. This is reflected in their high quality foods. Most of their protein comes from plant sources, with the exception of their Legacy formulas, which are heavily meat-based. There’s no doubt your wee one will thank you for choosing Horizon. Varieties: Grain-Free Puppy, Grain-Free Senior, Grain-Free Fish Adult, Grain-Free Red Meat Adult, Grain-Free Small Breed Puppy, Grain-Free Small Breed Adult, Grain-Free Small Breed Senior, Grain-Free Large Breed Puppy, Grain-Free Large Breed Adult, Grain-Free Large Breed Senior. Keeps your dog’s gut happy, while making him shine from the inside out! Family-owned and operated since 1999, this proudly Canadian dog food company is obviously a big fan of providing customized nutrition for every pet. Whether your dog is a mammoth-in-the-making or more closely resembles a mouse, you’ll be able to find a grain-free dog food that was designed to meet your dog’s unique needs. And Petcurean doesn’t only create customized dog food according to size, you can also find the formula that will meet your dog’s needs depending on his current life stage (including puppy, adult, and senior). The main message is that if you’re a dog owner that loves choice then you’ll be head over heels for Petcurean’s NOW FRESH formulas. Although you may be overwhelmed at the sheer number of varieties Petcurean offers, you don’t have to worry too much about picking the wrong formulation. Despite each variety being tailored to meet the needs of dogs of different sizes and ages, all formulas still have certain core benefits in common. Every formula comes complete with the benefits of healthy plant and animal based fats. In fact, after switching your dog to NOW FRESH, you’ll be impressed with how silky and shiny his coat has become. And the reason your dog will have appeared to have just stepped out a hair salon is due to the addition of omega-3 and omega-6 fats from salmon, and beautifying saturated fats from coconut oil. Also, don’t discount the power of a dog food that can revitalize your dog’s digestive tract. NOW FRESH comes equipped with high-fiber fruits and vegetables like pumpkin, apples, peas, and carrots that will keep Fido regular, while also supplying him with a hefty dose of antioxidants. Plus, the addition of probiotics will ensure your pooch doesn’t become overrun with bad bugs that could cause gas, digestive upset, and skin conditions like rashes or eczema. Your dog’s oozing and red skin is actually just a manifestation of what’s going on inside of his body, especially his digestive tract. A healthy digestive tract means a beautiful and healthy looking dog! Overall, Petcurean’s NOW FRESH dog food formulas are the perfect grain-free option for dogs of any life stage or breed. Grain-Free: Free of wheat, rice, oats and other grains. Moderate Protein: 26% protein from whole animal sources including turkey, salmon, and duck. Digestive Health: High-fiber fruits and vegetables, combined with probiotics will keep your dog’s gut healthy and happy. Healthy Coat and Skin: Omega 3 from salmon and saturated fat from coconut oil will give your dog a shiny and silky coat. Multiple Varieties: Petcurean offers a formulation for every life stage and every size of dog. Proudly Canadian: Family-owned and operated since 1999. Maybe you’ve considered the raw food diet before because you’ve heard of all of the amazing health benefits your dog could experience eating a diet that was similar to what his wild ancestors would have eaten. The only problem is you don’t exactly have the time to spend your evenings separating liver and chicken breast into individual baggies. The solution to your time-crunched schedule is Holistic Blend! 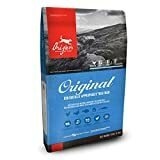 This Canadian owned and operated company has spent the time and effort to produce a kibble that contains all of the benefits of a raw food diet. The reason raw food diets are all the rage right now is because they provide your dog with an extremely nutrient-dense diet that aligns with what his wolf cousins would have eaten. Compared to conventional kibbles, which can be so overbaked that there’s hardly any nutrition left in it, a raw diet provides nutrition that is easily absorbed by your dog’s digestive system. Holistic Blend gives you all the benefits of raw by cooking their kibble at a low temperature to ensure none of that nutrition is lost! Also, they only use human-grade ingredients so you won’t have to worry about your dog eating animal byproducts or other unappealing parts that were unfit for human consumption. Another benefit of Holistic Blend is that it is perfect for dogs that experience inflammation, whether that be an itchy skin condition or painful joints. By buying Holistic Blends, you’ll be providing your dog with anti-inflammatory spices like turmeric and cinnamon, while also turning off pro-inflammatory signals using omega-3 fats. Less inflammation means less pain and a happier and healthier pet! Plus, all of those omega-3s will inevitably give your favourite pooch a soft and silky coat that is bound to turn heads during your next trip to the dog park. Overall, Holistic Blend is a great option for pet owners who want the benefits of a raw diet without the hassle. The bevy of bioavailable nutrients combined with anti-inflammatory ingredients will reduce pain and inflammation in your favourite four-legged best friend. High Protein: 38% protein from turkey and salmon. Healthy Coat and Skin: Omega 3 from salmon will give your dog a shiny and silky coat. Bioavailable Nutrition: Human-grade ingredients combined with a low-temp cooking process gives your dog the benefits of a raw food diet. Anti-inflammatory: A high omega-3 fat content, combined with anti-inflammatory spices like turmeric and cinnamon, will reduce inflammation and pain in your dog’s body. Hypoallergenic Formula: Using unconventional meat sources like turkey and salmon is a great option for dogs who have developed sensitivities to chicken, beef, and pork. Proudly Canadian: Family-owned and operated since 1993. All ingredients are sourced from Canada, the US, or New Zealand. Varieties: Legacy Adult, Legacy Fish, Legacy Puppy. If you’re looking for a food that will nourish your dog’s gut then look no further than Horizon’s Legacy formulations. This Saskatchewan-based company knows that a healthy digestive system equals a healthy and happy dog. Unlike other dog food companies that add a couple of ingredients to ‘pad the label’ in an attempt to lure dog owners in, Horizon has gone the full mile by creating a well-rounded and comprehensive formula that covers all the bases needed for a healthy gut. First of all, you won’t have to worry about canine constipation anymore because Horizon’s high-fiber content from fruits and vegetables means Fido will be experiencing regular bowel movements. Plus, all that fiber and the addition of prebiotics will feed the good bacteria that hang out in your dog’s digestive tract, which are needed to properly absorb the nutrients your dog eats from his food. In addition, Horizon has added probiotics to ensure your pup is being populated with only the best bacteria. By adding enzymes and yucca (an herb), Horizons is ensuring that your dog is able to fully break down the food he’s eating. Remember, you’re not what you eat, you’re what you absorb! Enzymes will help your dog digest his food so that he can absorb the nutrition from it, while also preventing undigested food from causing painful and irritating tummy troubles. Finally, if you’ve always wanted your dog to have fur that resembled the hair of a young maiden out of a fairy tale, then definitely consider going with Horizon’s Legacy formula. When it comes to skin and coat health, fat is your dog’s best friend. The combination of omega-3s from salmon oil and flaxseed, and the saturated fat from chicken will give your dog’s body everything it needs to create a beautifully brilliant coat. To be clear, Horizons Legacy is a gut-nourishing formulation that will keep your favourite furry friend regular, while gifting him with a beautiful coat. High Protein: 34% protein from chicken, turkey, and salmon. Digestive Health: A combination of high-fiber fruits and vegetables, yucca, probiotics, prebiotics, and enzymes to create a digestion of steel. Healthy Coat and Skin: Omega 3 from salmon and flaxseed will give your dog a shiny and silky coat. Proudly Canadian: Family-owned and operated since 2007, and based in Saskatchewan. Varieties: Salmon Large Breed, Salmon Adult Dog, Turkey and Duck Adult Dog, Red Meat Adult Dog. As our dogs get older, it can be harder to find a food that works with their changing and aging bodies. When he was younger your dog could eat just about anything and still have energy to burn, but he now seems to have become a bit more sensitive with age, and eating the wrong food can send him into a lethargic and gassy tailspin. The answer to your aging dog’s new nutritional needs is to drop the low-quality dog kibble, and opt for something that is nutritious and designed for the aging canine. Consider Nutreco’s Wholesome Blend as the perfect option for your elderly canine. This high protein food will give your dog’s body the building blocks it needs to retain lean muscle, without an excessive amount of carbohydrates that could lead to too much fat being put on. Remember, just like people, dogs can gain weight as they get older too due to a slower metabolism and lower activity levels. All of that protein will give your dog a zest for life that will keep him playing fetch long into his golden years. At the same time, Nutreco supplies your aging pooch with nutrients that will directly nourish his joints and reduce painful inflammation in his body. The addition of glucosamine and chondroitin will help build up tissue and cartilage between joints that are starting to grind together due to wear and tear. And omega-3 fats from fish will help turn down painful inflammation in the body that could be caused by arthritis. Finally, Nutreco is a great option for older dogs that have become more sensitive to food with age. Many dogs are now developing allergies and sensitivities to commonly used proteins like chicken, beef, and pork, so these popular meats are no longer an option. Fortunately, Nutreco has opted to use more unconventional proteins in their formulations including fish, turkey, and duck, which are unlikely to cause a reaction in sensitive dogs. The bottom line is Nutreco’s Wholesome Blend is a great grain-free option for senior and aging dogs who need wholesome nutrition with joint support so that they can live an active and vibrant life well into their golden years. High Protein: 31% protein from turkey, duck, and salmon. Healthy Coat and Skin: Omega 3 from salmon, and monounsaturated fats from olive oil will give your dog a beautiful coat. Joint Health: Glucosamine, chondroitin, and omega-3 fats help repair joint damage and reduce inflammation in the body. Proudly Canadian: A Canadian company based in St.Mary’s Ontario since 1983. As you can see, there are a lot of options for dog owners who want to feed their dog a Canadian-made high-quality grain-free food! So check out some of the brands above! I’m sure you’ll be impressed!